That’s a problem for many indigenous Dayak communities, who live amid massive palm oil plantations and logging companies on their traditional lands. But some people are using basic mobile phones to fill this media void. They’re texting the news, and they say it's making a difference in their lives. The citizens of Indonesia are among the world’s most avid users of the Internet and social media. But not everyone is so well-connected in the sprawling archipelago nation. In remote corners of West Kalimantan, the closest village may be hours, even days away and getting the news in — or out — can be difficult. Adrianus Adam Tekot is a Dayak community leader who lives in a village outside Pontianak, in West Kalimantan. Adrianus Adam Tekot lives in a village outside Pontianak, West Kalimantan's capital. He's one of several people who have been trained to send news from his village by SMS, or text message. Adrianus says local media have traditionally ignored the issues his community grapples with, from impassable roads to disputes with a major palm oil company. Adrianus trained as a citizen journalist as part of a program with a community TV station in Pontianak. He uses basic mobile phones to send news leads by SMS message. The only road leading to Adrianus' village is muddy and at times impassable during the rainy season. Vast swathes of land around Dayak villages are occupied by palm oil plantations. The road to Adrianus' village is a bumpy dirt path that cuts through miles of palm oil plantations. Officially, it's the national highway, but the road even a few miles outside Pontianak is jolting at the best of times, and virtually impassable during the rainy season’s wettest days. Text messages from Adrianus and his colleagues have spurred sustained local media coverage on issues that have long antagonized the communities: pollution from plantations, key bridges left in disrepair, government offices that rarely open. The conditions of the main road — the responsibility of the palm oil company to maintain, he says — is a constant source of news. Journalists at RuaiTV, a community television station in Pontianak, receive news sent in by SMS, follow up on promising leads, and send the news out later by text message. The backend of the scheme relies on software provided by FrontlineSMS. Citizen journalists like Adrianus send their news to RuaiTV, a television station in Pontianak focused on indigenous Dayak communities. A team of journalists receive the text updates and follow up on promising leads, attempting to confirm facts. Verified news tips are distributed, also via SMS, to a list of subscribers that includes local residents and government officials. Journalist Harry Surjadi began the SMS news program in 2010, training 200 villagers from around West Kalimantan as citizen journalists. Jakarta-based journalist Harry Surjadi founded the RuaiSMS program because of what he sees as a dearth in coverage of key environmental issues in the Indonesian media. “If there are hundreds of land conflicts, then it should be big news in the newspaper, but it’s not," he says. He still keeps the first SMS sent by a citizen journalist — Adrianus — on his phone. Stefanus Masiun, RuaiTV's director and co-founder, says indigenous communities face threats from logging companies, land grabs, and environmental destruction in their traditional lands. Stefanus Masiun is the director and co-founder of RuaiTV. A Dayak himself, he says indigenous communities have traditionally been marginalized. “Indigenous peoples in West Kalimantan mostly don’t have access to media. They don’t have access to services,” he says. Alim, who uses one name, is a journalist and host of RuaiTV's evening news show, which features news and updates sent in from citizen journalists like Adrianus. He believes his work helps to preserve his cultural traditions amid rapid development. "Whenever there is anything happening in the community, I can get the news directly and I will put it out in the media," he says. The studio at RuaiTV, a community television station in Pontianak. 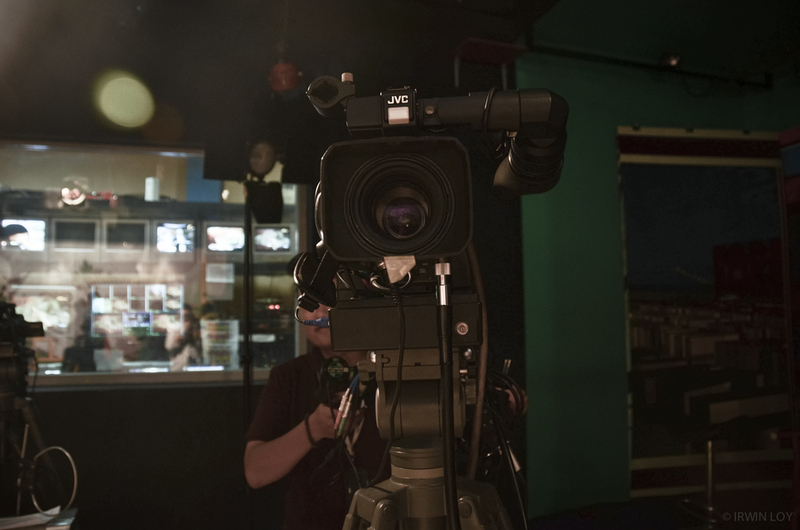 A camera operator gets ready to film the evening newscast at RuaiTV, a community TV station in Pontianak, West Kalimantan. Alim, a journalist at RuaiTV, watches the screen as a pre-recorded TV package plays during the evening newscast, which he hosts. Alim grew up in a remote Dayak village that is several days' travel from Pontianak.